Once you get out in the Badlands, you’ll look around and say, Wow. What is this place? It is ripe with old west stories, myths, and legends — from lynchings to killer blizzards. So, prepare yourself with a deep dive into the stories that are hidden in these hills — the mysteries of the North Dakota Badlands. There’s no bragging here, but then that’s the cowboy way to not brag. So, here’s how you find the REAL story — these books with exciting stories prepare you for your trip. Before you head into the North Dakota Badlands, discover eye-opening real stories. After all, there are 1,500 square miles of Badlands and Grasslands with 10 times that in amazing stories. Towns from Bowman to Crosby, Medora to Watford City, Killdeer to Beach shine in the spotlight of significance when you know more. Here are five books about the late 1800s and early 1900s — which is Theodore Roosevelt’s time period. Three different styles and sources — with two additional companions to one of the books. Hence three-point-two, or 3.2. Here are our first recommendations. You can see exactly what he wrote about 120 years ago. Sometimes we take the book with us when we go to the Elkhorn Ranch Site north of Medora. There we can read the eloquence of the first Badlands Blogger, Theodore Roosevelt. He describes the hunts in the land where we are now hiking. He uses words like a paintbrush to illustrate the challenges of raising cattle in the cuts, draws, ravines and hills where we are when we visit the ranch site. The Frederick Remington illustrations are an added value to the book. A second companion book is Theodore the Great. Like Ellison’s book, Daniel Ruddy’s book clears up some of the mythical histories of Roosevelt that have been politically perverted over time. Some stories of Roosevelt are told for political reasons and do not match up with his life in the west. It’s where he learned the value of hard work, law and order, and how to get along with people. Ruddy’s book clears up those political myths that paint Roosevelt as what today we would call “a progressive.” He was not. One of the best parts of this book is the author’s notes at the end of each chapter. The chapters are Van Blaricom’s narrative, and the author’s notes at the end fill in the blanks and provide a historical perspective. We had no idea! Though we spend countless hours, days and weeks exploring the landscape of the Badlands and the communities isolated from the rest of the world, the deeper mysteries of the Badlands have become our fuel. These three books are focused on Medora, the Little Missouri River, and western area. There are more and we’ll introduce those to you in another story. We’re amazed at the landscape and the romantic nostalgia of the North Dakota Badlands — and that amazement increased the more we found out. So, driving us to know more, and understand more, we have learned how this region supplied the nation with beef after the Civil War. We have discovered why elegant rail cars sit abandoned. It’s amazing to learn why two lift bridges sit idle over major rivers. 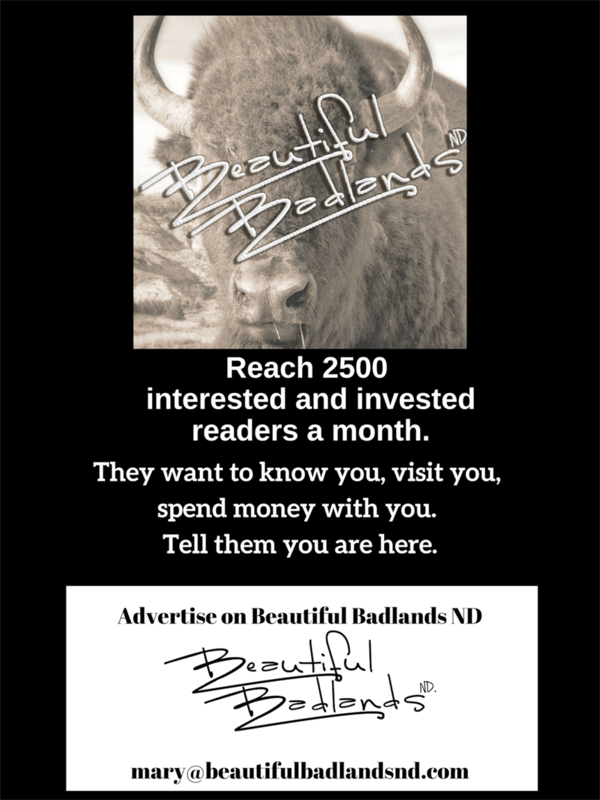 We love to meet with local groups to give them an appetizer of what they might find in the Badlands of North Dakota. That’s why we write these articles and share them with you. We’ve got more installments ready to share with you of books you’ll want to read yet this winter. Here’s how to know when they are posted: You can get a notice in your inbox when a new story is posted. Just subscribe in the upper right. Got books you want to add to our recommendation? Please tell us! Stay excited about the North Dakota Badlands!